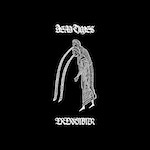 Here we have a split LP from Rhode Island’s Dead Times and Trtrkmmr (pronounce that if you can), the solo project of the ex frontman for Death/Doom merchants Otesanek; this is not a collaboration, but a record of opposing, if not similar forces. Dead Times provide a barrage of noise and samples; a tried and tested formula for many power electronics artists out there. It’s a hard field to truly master as an art form as many have tried and many have failed. I would say that Dead Times do a more than competent job of layering hidden rhythms and in such a genre, this is the hardest trick in the book to nail down. Additional guest vocals come into play from Sewer Goddess on ‘Pain Arrives’ and this is most likely the highlight from DT’s side of the album. If you have heard Sewer Goddess then you will know exactly from which angle she approaches the genre, slotting her screaming banshee throat-work into the track with little issue. A touch of electronic-grind is the main foundation to Trtrkmmr and how he approaches music. Sampling in fast looping rhythms and tape loops alongside film samples, which surprisingly filter through and do add an almost psychotic soundtrack element to the proceedings, albeit slightly so. I did enjoy this half of the album more than Dead Times, as it was easier to approach and digest. Overall this release is a credible addition to the power electronics and noise genres as a whole; it’s not going to set the world alight and yes this has been done many a time before, however aficionados of the scene should more than relish this album from two relatively unknown artists.